These products'll help you become the practical adult 2017 always knew you could be. 1. An Instant Pot you can basically replace your entire kitchen with, kitchens are so 2017. The Duo Plus replaces nine common kitchen appliances. It can be used as a pressure cooker, slow cooker, rice cooker, yogurt maker, and egg cooker, with the ability to sauté, steam, warm, sterilize... and oh, it makes cakes too. 2. A key hook with an ode to your old self. 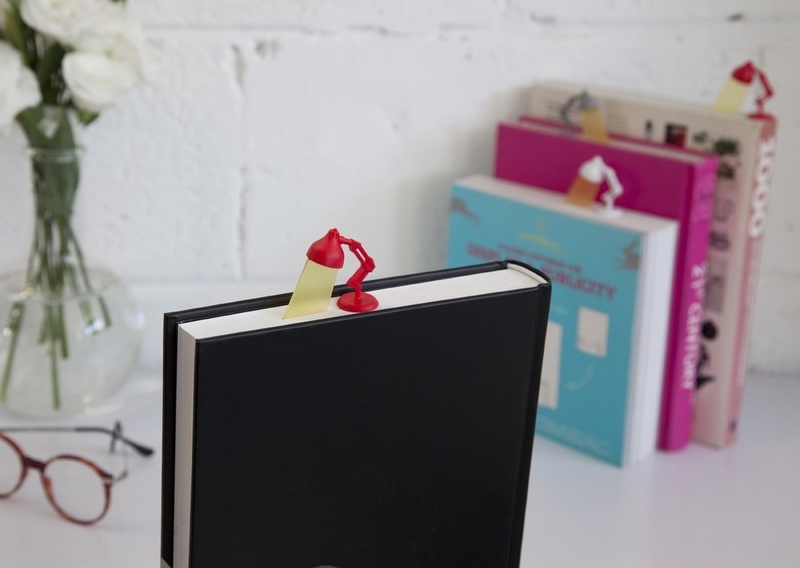 It'll make finding your keys so easy you'll never be late again. 3. A meal prep cookbook to help ease the cholesterol levels you built up from stress-eating through all of 2017. Get it from Amazon for $10.31. 4. And a set of 16 incredibly useful meal prep containers that may help you actually eat said meals. Each container is microwave-, freezer-, and dishwasher-safe, and designed with a leak safe seal. 5. A mini emergency kit prepared for the dreaded surprise period, losing the back of an earring, a not-so-subtle armpit smell, and just about anything else you can MacGyver your way out of with a hairpin. But wait! There's more! This cute kit includes a deodorant towelette, stain remover, nail polish remover, dental floss, clear nail polish, lip balm, breath freshener, mending kit with safety pin, double-sided tape strips, clear elastics, emery board, bobby pins, and hair spray. Sign me up for twelve! Get it from Anthropologie for $21 (available in two colors). 6. A portable unicorn charger that'll save your iPhone from the certain death it already experienced in every over-photographed concert you were at last year. 7. A luxurious cotton bed set designed so you never have to tuck in your sheets (or frantically make your bed when someone knocks on the door of your studio apartment) ever again. Get them from JCPenney for $69.99+ (available in three sizes and nine colors). 8. A pair of blackout panel curtains for when your weekend plans do not include waking up in the daytime. Get them from Amazon for $14.98 (available in nine colors). 9. A nail polish holder that may make painting your nails easy enough that you won't keep acting like "chipped" is the new black. 10. A memory foam pillow so you can take care of your neck and break up with your chiropractor. 11. 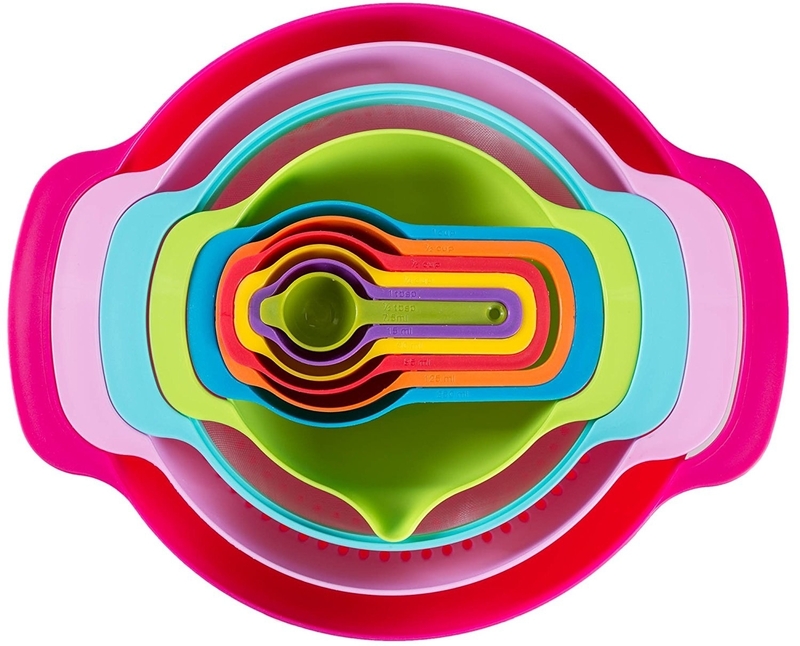 A set of rainbow nesting bowls for making storage (and baking) a breeze. 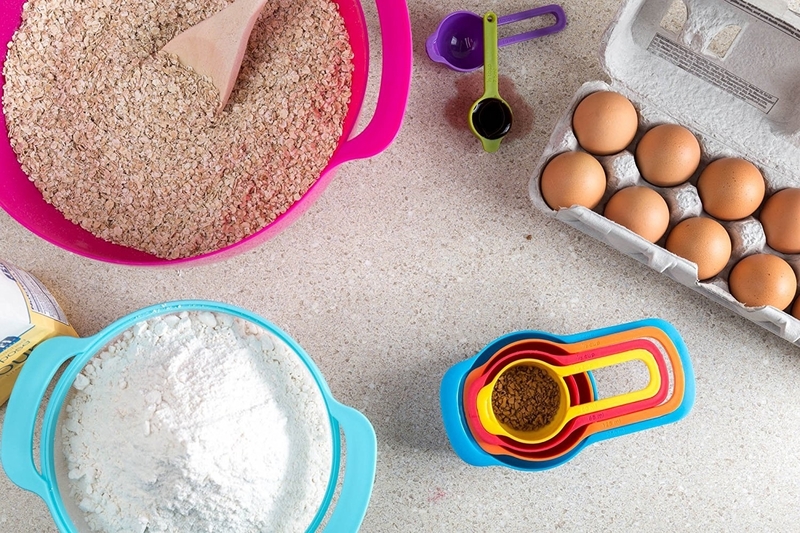 This set includes a mixing bowl, colander, sieve, measuring bowl with spout, 1/4, 1/3, 1/2, and 1 cup measuring cups, with a 1/2, and 1 Tbsp, and is dishwasher-safe. Get them from Amazon for $25.95 or from Walmart for $29.95. 12. A geode jewelry box that'll be a spacious place to store hair ties, bobby pins, loose change, and the one actually valuable necklace your grandmother gave you when you turned 18. Get it from Pier 1 for $19.98. 13. A set of critter sheet masks to wake up your makeup routine. Get them from FireBox for $16. 14. A set of five kitchen knives that just may work slightly better than the butterknife you've been "getting by" with all year long. Includes a paring knife, utility knife, carving knife, bread knife, and chef's knife. 15. A Tasty One Top to make following a recipe on your phone easier than following through on the dinner plans you made with your Tinder date (whatever you cook will taste better than the $13 avocado toast he was raving about anyway). 16. A book on planting indoors, because this is the year your home will finally be filled with lush, living, green plants. Get it from Amazon for $16.99, Barnes & Noble for $17.66, Urban Outfitters for $24.99, or a local bookseller from IndieBound here. 17. Or maybe a faux potted palm. Being responsible for a life other than yours sounds like a 2019 sort of thing. Get them from WayFair for $49.99. 18. A powerstrip to organize the cords in your home in a beary cute way. Includes an FCC-certified surge protector, four large, spaced outlets, two USB ports, and a 5.9-foot cord. Get it from Amazon for $21.78. 19. A glitter cocktail shaker you just may use every time you celebrate how responsible the new you is (ignoring the fact that this very cocktail shaker may likely be the reason you're sleeping beside the toilet that night). Get it from Nordstrom for $30 or Ban.do for $30. 20. And a cocktail book with drinks based on famous literature so you can whip up something respectable. 21. And while we're at it, an Italian crafted decanter and set of six glasses for these celebratory, literary beverage events. Get them from Amazon for $27.99. 22. 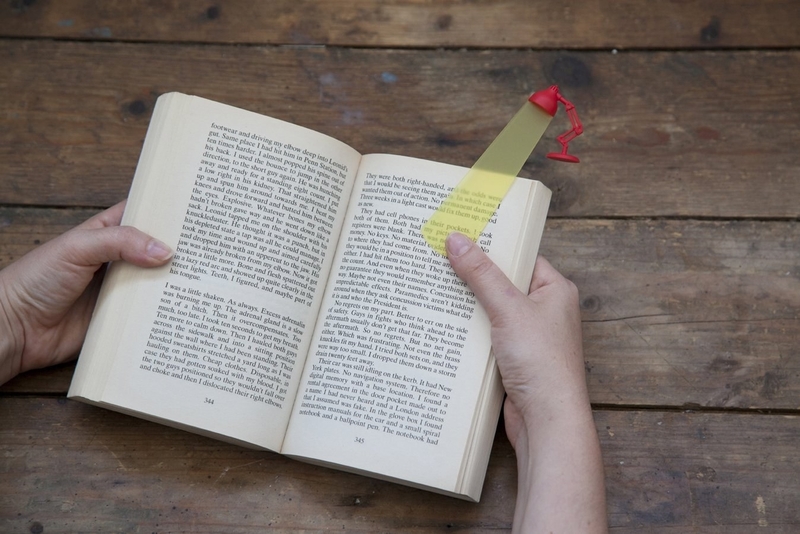 A lamp light bookmark — it's gonna be the brightest way to keep you reading this year. Get it from Amazon for $4.99+ (available in two colors). 23. A clear State tote bag you won't ever lose anything in, even when you carry everything you own in it. Get it from Free People for $49.95. 24. A rack riser with pocket shelves that'll finally give you the added counter space your roommate still thinks you don't need. 25. A robot vacuum/mop for anyone who thought cleaning the floors was just a suggestion last year. Promising Review: "It was easy to set up and it's pretty quiet. It vacuums my whole living room, kitchen, and dining area in one charge. It maneuvers great around the house. I am very pleased. My floors are even clean enough after the vacuum that I hardly need to use the mop feature. I would definitely buy it again." —Courtney W.
26. A set of clear, airtight containers that are gonna help you see the light (and the Chips Ahoy) while organizing your kitchen. This set includes five containers of varying sizes, each with an airtight seal. Get them from Amazon for $47.59. 27. A carry-on suitcase made to let you easily escape from reality whenever a vacation is calling. Those breaks are an important way to stay sane. Get it from Urban Outfitters for $125 (available in two colors). 28. A pack of four chip clips for keeping your food fresh and cutting your grocery bill in half from what it was last year (at least where potato chips are concerned). 29. Or a pack of three bag ties, so your bread won't be toast. Get them from The Container Store for $4.99. 30. A set of six thin wooden hangers with grips that'll keep your clothes from falling off the hanger (which'll improve the floor pile "system" you've currently got going on). Get them from The Container Store for $7.99+ (available in multiple packs). 31. A portable steamer for keeping your freshly hung clothing wrinkle-free. 32. 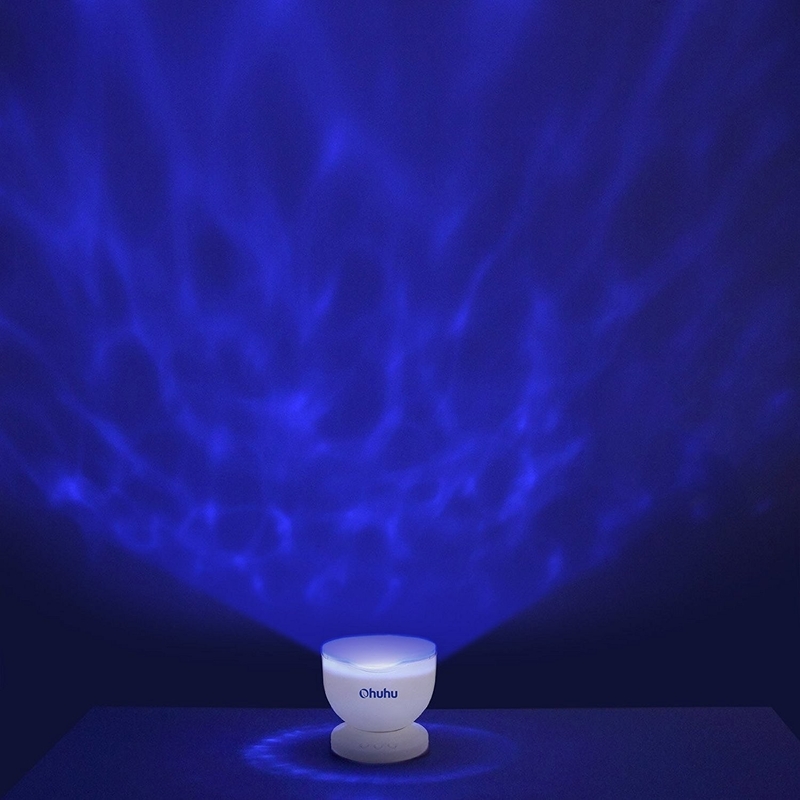 A light projector that may help you get the best sleep you've had in a year. 33. Or a white noise maker that's gonna be so much better than sleeping with your fan on all year long. 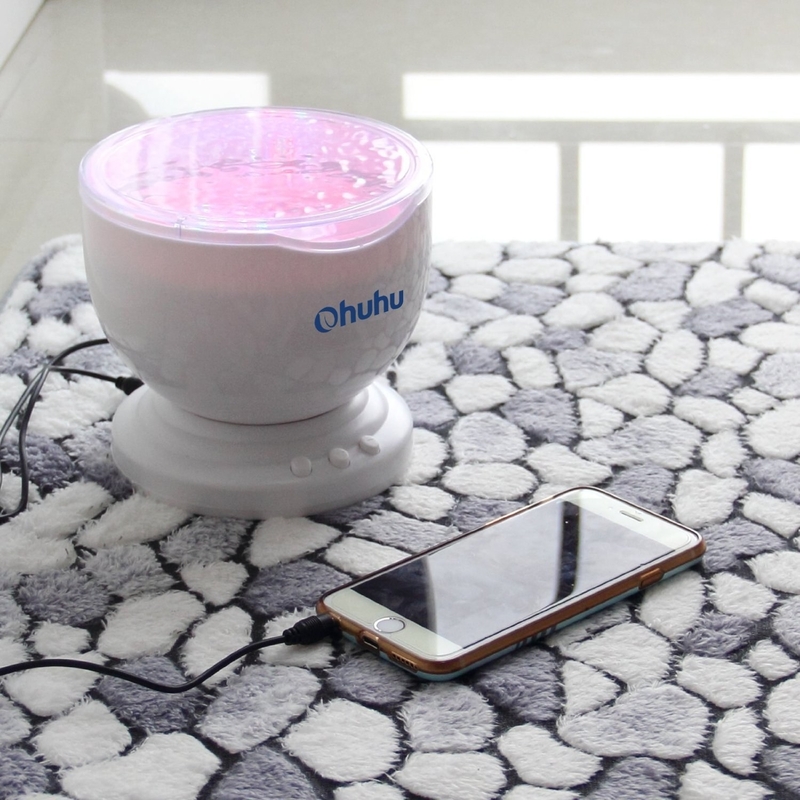 Includes 20 uniquely soothing sounds, a memory function to adjust to your favorite sleep settings, a timer that lasts one to seven hours, and it has both a power adapter and USB cable for easily, portable use. Get it from Amazon for $36.99+ (available in two colors). 34. A double hamper to keep your clothing separated by color (not that everyone hasn't loved all the pink dress shirts you've been wearing to the office, because they are loved). This hamper includes removable mesh bags for easily transferring your laundry. Get it from Amazon for $39.96 (available in four colors). 35. A motivational water bottle for your thirsty self. Get it from Uncommon Goods for $19.99. 36. An Angry Mama microwave cleaner so you can eat the food cooked in your microwave without worrying about what other meal's messes may be mixed in. Get it from Amazon for $8.99 or The Container Store for $9.99. 37. A set of dandruff shampoo and conditioner to soothe your itchy scalp all year long. Get them from Aveda for $22+ each (available in two sizes each). 38. And a Wet Brush that's gonna help the hair you just washed be silkier and smoother than you've ever seen it. Get it from Amazon for $8.98+ (available in five colors). 39. Finally, a Nifty journal sure to change your life in the new year, one clever organizational trick at a time. Get it from BuzzFeed's Nifty shop for $22.95. That moment when you realize you've got your life back on track.